Why Finnish Babies Sleep in a Cardboard box? Link to original article from B.B.C. on Why Finnish babies sleep in a cardboard box? For 75 years, Finland’s expectant mothers have been given a box by the state. It’s like a starter kit of clothes, sheets and toys that can even be used as a bed. And some say it helped Finland make one of the world’s lowest infant mortality rates. It has bodysuits, a sleeping bag, outdoor gear, bathing products for the baby, as well as diapers bedding and a small mattress. of the box’s cardboard walls. Mothers have a choice between taking the box, or a cash grant, now set at 140 euros, but 95% opt for the box as it’s worth much more. “Not only was it offered to all mothers-to-be but new legislation meant to get the grant, or maternity box, they had to visit a doctor or municipal pre-natal clinic before their fourth month of pregnancy,” says Heidi Liesivesi, who works at Kela – the Social Insurance Institution of Finland. In Denmark, we did something similar from the thirties and onwards just without giving out a box like the Finnish. Nurses, specialised on children were educated to visit all homes just after the baby was born to support breastfeeding and healthy living and in safe surroundings. A kind of schooling for parents in their own homes. None of the visits was compulsory, but as it became so accepted very few ever declined the offer. Included was some prenatal check-ups at the family doctor and the midwife preparing for the birth. It is all free for everybody. I was employed doing this job for more than thirty years. In an exhibition on circulation here in Scandinavia called “The century of the child” these pictures can be seen. It describes how things began to be created for children in a new scale as the death rate went down and families could start to expect their children to LIVE! Children´s books, play parks, furniture and functional clothes were made. 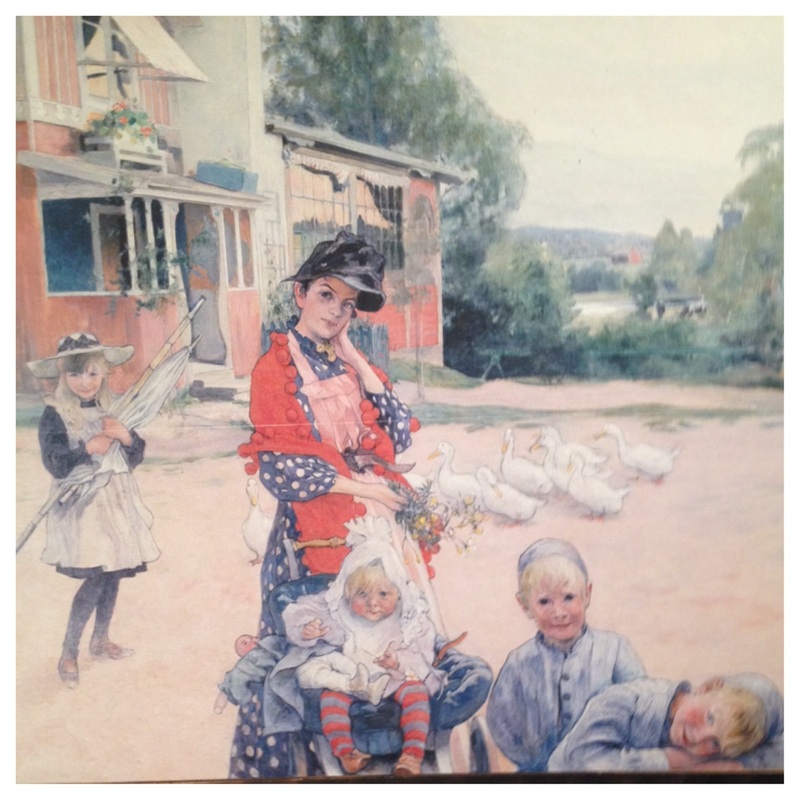 The idea that families took the responsibility to make the children a priority is clearly seen in Carl Larsson’s beautiful scenes from his home in Sweden. Oh, that’s a nice touch – even if the mother can buy all this, when it’s your first baby you’re bound to forget one thing or another. Thank you for reading and following too. In Finland they were very poor before, during and after the WWII. Most of their children had been evacuated to Sweden and Denmark during the war. I am sure it boosted the wish to get babies to get these nice things. Nowadays I think they should give the package to those who need it. Or that you could order what you need. I know that your people in the Ukraine have been through tough times then and now. Thank you so much for reading and commenting Catherine. In my opinion I think a distinction should be made if its a family with the first child or with more children. Much can be used again in the small sizes. It’s a very special feeling to be able to get your own box from the post office when you are pregnant. And even better when you go home to look at all the goodies it contains – and to imagine your baby soon needing them! Dear Suvi! Your answer brought tears in my eyes. It’s really lovely to hear that people appreciate it. I had a feeling like if you get a lot for free then you don’t value it so high. I saw the exhibition on “The Century of Childhood” twice. First in Värnamo and then in Copenhagen. I saw the boxes there and the pictures which I put in my blogpost on the same name as the exhibition. I have a friend as I said before from Finland, but she never told me so much about it. Do you think that some people even today have the box as a cot or crib? What a lovely start for mother and new baby. I enjoyed reading about this very good and sane idea. Thank you Judy. I posted old posts because at the time only few saw my writing. I’ve been doing the same frequently, Maria. Makes good sense and gives me a chance to edit and change. The same for me. I have bought an editor app called “Grammarly “and I am finding loads of errors in the old posts. Very edifying!